How do you arrive at a top ten most popular dog breeds list? Let the American Kennel Club do the counting for you. Do you have a favorite purebred dog breed? Many people do. In fact, many people want to know which breeds are the most popular, so the American Kennel Club (AKC) has taken on the task of compiling an annual top ten list. This club maintains the largest registry of purebred dogs, and uses yearly registration statistics to determine which breeds are currently most favored. Is this a completely accurate way to arrive at a top ten? Perhaps not because there is no way to account for all of the unregistered purebred dogs that never show up in the AKC's system. Still, it does give us a fairly good estimate which breeds the public tends to favor. 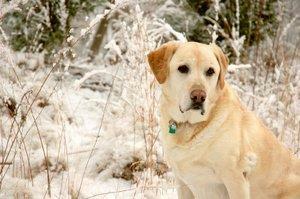 Labrador Retriever: The irrepressible Lab has been top dog for quite some time. These medium sized canines were bred to retrieve waterfowl, but they're just as happy to take a swim with the family. Yorkshire Terrier: The dapper little Yorkie enjoys its second year in the number two spot. These tiny canines pack big personalities, but the thing they love best is being in your lap. Feisty like a terrier should be, but elegant looking nevertheless, the Yorkie has definitely carved out a niche in our hearts. German Shepherd Dog: This breed has long been a symbol of fierce beauty, but the truth of the matter is it's difficult to find a more loyal pet. Shepherds keep watch over those they love, and treat strangers with cautious reserve. Golden Retriever: Happy-go-lucky Goldens can be a handful, but they're usually up for anything. Like fine wine, Goldens get better with age, and that boisterous pup will one day morph into a charming adult companion that still remembers what it's like to be young and carefree. Beagle: This is perhaps the quintessential breed, having been continuously in the top ten since its inception. Beagles are strong-minded and require plenty of exercise and mental stimulation. Boxer: The Boxer looks intimidating with its muscular build, but ask anyone who lives with this breed and they'll tell you Boxers are lovable clowns that make wonderful family companions. They can be a bit rambunctious, especially when young, so obedience training should begin early. Dachshund: Bold, feisty and affectionate; that's the way most owners describe their Dachshund companions. This breed's long and low structure has fascinated dog lovers for quite some time. Poodle: The fluffy Poodle is another perennial favorite on the top ten list. Cuddly Poodles come in three sizes: Toy, Miniature and Standard. There's a perfect fit for everyone. Shih Tzu: The Shih Tzu has enjoyed a berth in the most popular dog breeds list for a number of years. It's hard to resist those big beautiful eyes and cute little muzzles. Whether you choose to keep your pet in flowing coat or a cute puppy cut, this is truly an adorable breed with a personality to match. Bulldog: Bulldogs are one of those iconic breeds that can't help generating attention wherever they go. Although not what anyone could consider a large breed, these dogs are incredibly strong-bodied and therefore not always easy to handle. However, they are extremely devoted companions and will provide you with plenty of love and loyalty. Although the AKC compiles all of its registration info into one master list, the actual breakdown of favorites is also sorted by geographic area. These additional lists aren't necessarily the same from city to city, and are likely influenced by the breeder population working with specific breeds. You can see the list for the major city closest to you by visiting the AKC's Top Dogs by City page. Do you have a favorite breed that's not on the most popular dog breeds list? Tell us about it in the comments box below.